Many of you know Alexa, Cortana and Watson, but have you heard of Lisa, Erica or Lieutenant Judy Hopps? Probably not. That is, unless you’re planning a trip with Amtrak, checking your balance on Bank of America’s website, or investigating mysteries from the Disney animated crime caper Zootopia. 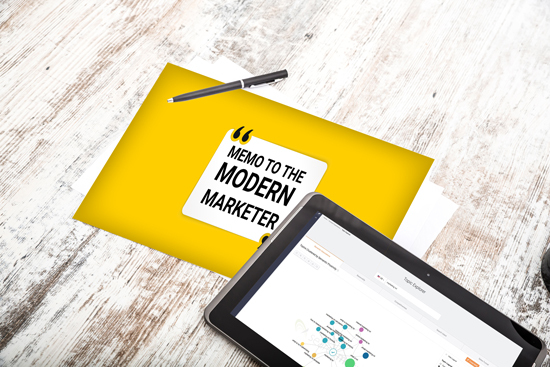 In this Memo to the Modern Marketer, we take a deeper dive into the world of chatbots, which are becoming an important way to improve business efficiency, scale marketing campaigns, ramp up conversions and reach the right customer at the best time with the perfect product. Chatbots – also known as “conversational agents” or virtual assistants – are software applications that mimic written or spoken human speech in real-time interactions with real people. Amazon is just one of dozens of companies that offer services to help companies create chatbots to handle customer service tasks and other online customer-facing engagements. There’s even software on Google Play that let consumers install a chatbot called Julie on their Android smartphones. Chatbots are no flash in the pan. Amtrak introduced “Julie” in 2012 and reported it increased bookings by 25%, while saving $1 million in customer service expenses in a single year. Amtrak bookings through chatbots generated 30% more revenue thanks to built-in upsell intelligence. Charter Communications experienced a 500% return on investment in the first six months of its chatbot implementation, and reported it reduced customer service costs by 44% in the first year. And when Good Spa Guide implemented one, it saw a 29% increase in website traffic in just six weeks. Sounds good, right? Only if done right. There’s plenty of devils that can be found in the details. Just ask Microsoft, a leader in deep learning and artificial intelligence work. In 2016, it released “Tay,” a Twitter bot that the company described as an experiment in “conversational understanding.” The experiment of AI in the wild went horribly wrong, with the chatbot adopting racist comments from its Tweet interactions. 1. How quickly can a chatbot “learn”? Most chatbot providers have very similar learning capabilities. They take data that is fed in and then respond in ways that resemble interaction with a human – without humans making more data input or reprogramming. Deep Learning goes even further and can learn while using unstructured data; this is also known as Deep Neural Learning or a Deep Neural Network. 2. How well can a chatbot “understand?” This refers to a provider’s natural language processing capability, which is the ability for a chatbot to map consumer inquiries in raw form to specific intent. Many CEOs worry they may get it wrong when trying to implement these AI tools. A 2017 PwC study found that 72% of CEOs believe that AI will bring future business advantages. But an almost equal percentage feared implementation, trust, and security issues. In January, videogame maker Ubisoft SA announced the creation of Sam, a voice and text chatbot personal gaming assistant. The maker of Assassins Creed and Far Cry set up an Ubisoft Club community, where Sam monitors clients’ game performance, provides one-on-one tips on game play, and offers individual players new games for sale. Based on the character Sam Fisher from Tom Clancy’s novels (and Ubisoft games), Sam also sends game notifications to keep customers engaged. Sam’s answers are human-curated, and the company began implementing his services on a game-by-game basis only in Canada. Ubisoft followed good AI implementation practice by introducing its bot in test mode. This allows the AI tool to gather data, learn, and improve. The incremental launch is also easier on the budget and allows for corrections. Other pluses: the bot has a personality. And finally, Sam’s answers are curated. Ubisoft hired VWO to make their bot, but the company took care to curate Sam’s dialogue and give him a persona. It’s easy to make a bot in a weekend; it’s hard to make a good bot with human qualities. That takes time, data collection and management, and a great brand narrative. Marketers can rely on in-house engineers or hire companies to build a bot. But they still have to make sure that the AI reflects their brand’s human story. At the 2017 Searchmetrics Summit in Berlin, Emilie Reynaud described some of the pitfalls associated with creating and launching a chatbot. One place you can go to quick build a bot to solve a specific marketing problem is the Microsoft Bot Framework. Another tool is Google’s open source TensorFlow project. Andrew Ng, a founder of the Google Brain Project, warns against using an open-source AI tool out of the box, arguing one size does not fit all. Marketers must understand where speech recognition and AI machine learning fits in the business. That includes needing to know exactly how to collect data for the ML model, and why and in what way you want to exploit it. In short: know what to do, what you can afford and what your clients love. Ng uses this workflow process for developing AI. The project manager will have an idea of what the product should be and what it should accomplish. He or she must communicate this project concept to the engineer and then translate that into an AI model. In the case of a chatbot, the engineer should ask the project manager to come up with a data set of 10,000 audio clips that shows what they want in relation to meeting customer needs. This test set gives the engineer an idea of what the project manager cares about. For example, if the people are talking in a busy environment, then the engineer knows to design the AI speech recognition to deal with background noise. The same goes for other variables, such as low bandwidth audio or accented speech. Marketers should curate dialogue if they want the chatbot to seem human. The project manager, marketing team and engineers should write out a minimum of 50 conversations that the chatbot is meant to have with a customer. Make sure you dive deep here. Brainstorm every possible use for the product and try to imagine every unexpected customer query. The process of the team working out what the user would want helps the project manager to communicate themarketing plan in practical terms to the site engineer. The engineer can respond by suggesting what is technically feasible. Since chatbots are built to respond to user behaviors, eBay AI designers recommend looking at user intent to know the bot’s best next question in a customer conversation. To do this, designers have to build a probabilistic inference graph, using past user search queries and related intentions. To capture user intent during the brainstorming stage of AI chatbot design, GraphAware Principal Consultant Christophe Willemsen turns to SEO data to relate search query topics to user intention and webpage rank. The goal is to recognize top keywords in user queries from an SEO analysis of your website’s content performance. SEO analysis can provide similar metrics for your competitors. The Searchmetrics Content Experience then can summarize the questions people ask in relation to a topic. Take ‘do it yourself’ websites. Since these are the most common questions asked that rank for the ‘do it yourself’ keyword phrase, you should build your strategy answering these types of questions. With SEO analyses, you can measure the most common topics and prepare answer sets to these sample questions. SEO metrics can be used, at least in the planning phase, to help build your bot. Later, you can reconsider this information when focusing on a knowledge graph of structured data while your bot is active. That said, it is hard to transition from traditional text-based SEO to conversational commerce, dialogue systems, and collaborative inferencing.